OPH2005 is a randomised, double-masked phase 2b study to establish the efficacy and safety of Zimura™ compared with placebo in subjects diagnosed with Stargardt’s disease inherited in an autosomal recessive manner. The patients will be randomly assigned to different groups. Men and women between 18 and 50 years old with a minimum of two pathogenic mutations in the gene ABCA4 that will be confirmed by the study laboratories. The visual acuity of patients should be between 20/20 and 20/200. The study aim of the study is to assess mean rate of change in the area of ellipsoid zone defect as measured by OCT.
Zimura is designed to inhibit C5 complement protein. Zimura binds to and inhibits C5 being cleaved into C5a and C5b, potentially preventing the formation of inflammasomes and the accumulation of the membrane attack complex (MAC), which would prevent cell death. 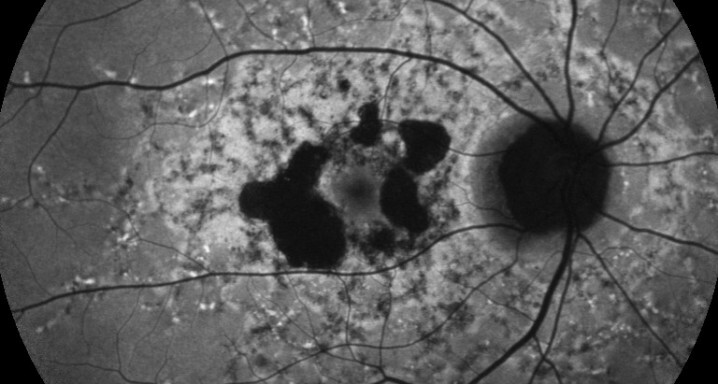 Subjects diagnosed with Stargardt’s disease between 18 and 50 years old with a minimum of two pathogenic mutations in the gene ABCA4 and whose visual acuity must be between 20/20 and 20/200. Moreover, the patients cannot present any other eye disease. The duration will be 18 months. These visits will have a fortnightly periodicity during the first three months and monthly from the third month until the end of the study.